On a hot summer day, there are few things more refreshing than dipping in a cool natural swimming hole amidst flora and fauna. These rushing rivers, quiet pools and sparkling waterfalls are ideal destinations for a summertime swim. Plus, they are all less than an hour away from Portland, making a last-minute swim more feasible. Not to mention, you can spend less time driving and more time soaking up the sun with your toes in the water! Some of these swimming spots are accessible with a few steps from the car, while others involve a trek through a forest (and in one case, through chest-deep waters!). Take a look at the many amazing swimming holes near Portland for an adventurous summer in the sun. Located just down the road from Portland in Gladstone, High Rocks Park is a popular destination for thrillseekers during the summer. This park has, as you could have guessed, high rocks that visitors jump from into cool, refreshing waters below. 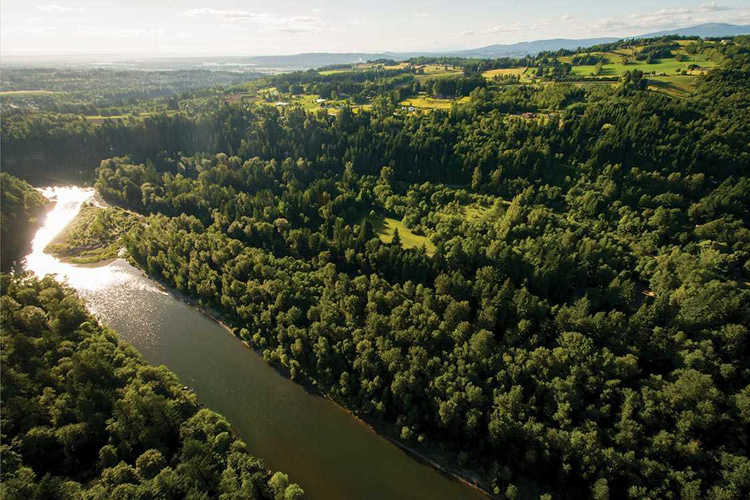 The park is situated along the Clackamas just before it meets up with the Willamette River. The rocky banks provide ideal cliff jumping conditions just high enough to make the plunge a thrilling experience! This is a heavily trafficked swimming hole in the area, but you can avoid crowds by visiting in early or late summer, when many have returned to school. Just before you reach Multnomah Falls, you’ll encounter the unique and scenic Rooster Rock State Park. Enjoy 3 miles of river access at this popular destination attracting lots of visitors during the summer. The beach is perhaps most known for its more free-spirited half, as the eastern portion of the park is designated as a clothing optional beach. The clothing optional area is completely separate from the remainder of the park, yet the two coexist in harmony. Whatever side of the beach you’re on, this swimming hole is the perfect place to cool off in the refreshing Columbia River on a hot summer day! NOTE: At the time of writing, Oneonta Gorge is closed until further notice due to the massive Columbia River Gorge fire of 2017. Check here for updates before visiting. For those who want to do a little grunt work to earn their scenic views, Oneonta Gorge is the perfect choice for your summertime swim. To see the secluded waterfall and dreamy, sparkling waters at the end of this 1-mile hike, you’ll have to maneuver a log jam and traverse through chest-deep waters. But believe us, the views at the end of the hike are well worth the trouble. You’ll feel as though you’ve encountered something out of a fairytale at Oneonta Gorge, which many don’t have the opportunity to see as they turn back when the hike becomes more strenuous. We suggest going on a hot summer day, as the waters here are particularly frigid. 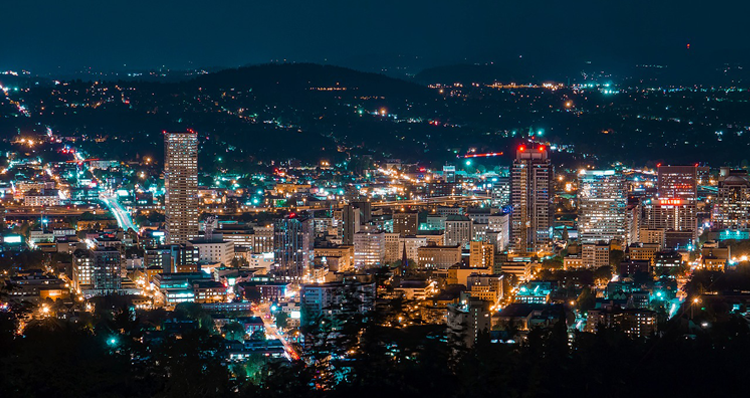 Located just east of Portland along the undammed Sandy River, Oxbow Regional Park is the closest taste of the Gorge you can get from the city. This makes the park a popular summer destination for swimming, kayaking, rafting or fishing. The current is peaceful and slow, as the river has wide curves winding through the park. Plus, there are plenty of rock-covered beaches to choose from for relaxing by the river’s edge with the whole family, plus 15 miles of trails through ancient forest, if you’re looking for a hiking adventure before you take a dip. Keep in mind that dogs are not allowed at Oxbow Regional Park! 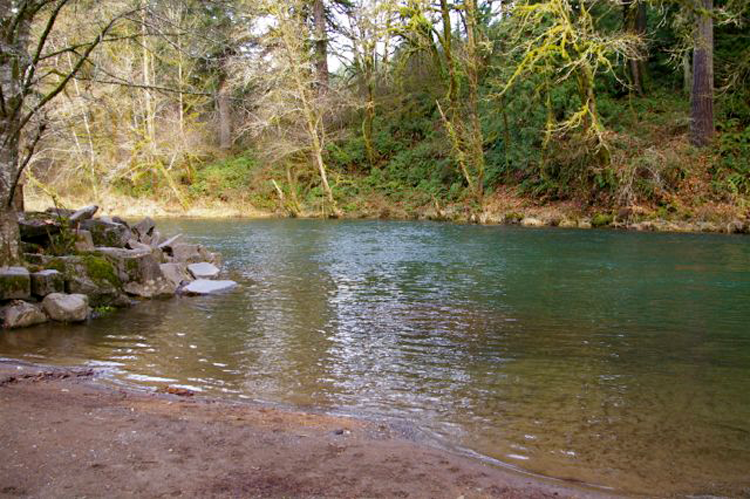 Lewisville Regional Park is situated along the Lewis River in Battle Ground, Washington. 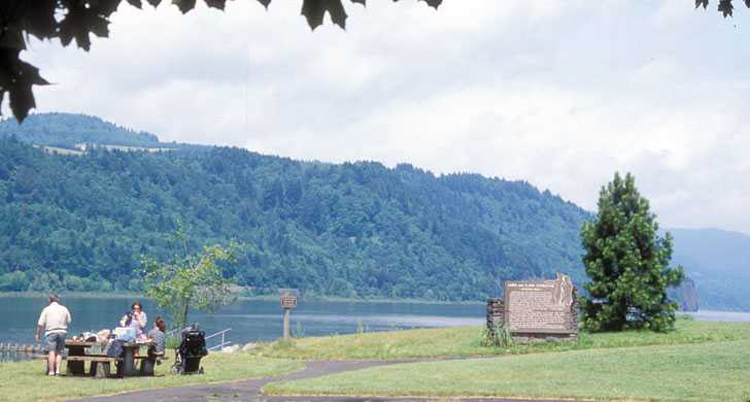 This 159-acre park is the oldest park in the county, and has long been a popular destination for Southwest Washington and Portland residents. In addition to fishing, picnicking, walking and playing on the playground, visitors may swim at a scenic bend in the river just beyond the baseball field. An expansive grassy patch functions as a beach and towering trees provide plenty of shade to keep you cool. Plus, the current in the river is quite gentle, providing ideal conditions for families or those who want to take it easy. 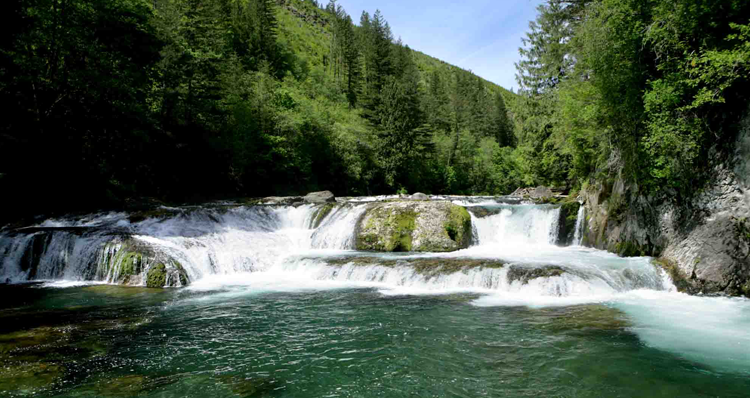 Take the 4-mile Moulton Falls Trail that travels along the Lewis River to reach the stunning Moulton Falls. It is here where you can do some cliff jumping, relax in the cool pools, enjoy a picnic, or simply take in beautiful forest and river views. 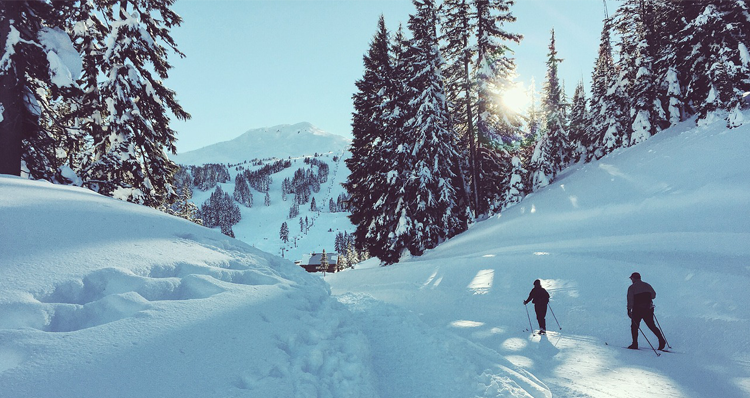 The wide, paved trail is primarily flat, which makes this an enjoyable hike for all ages all year long. In fact, the drive up to this trailhead is enjoyable in an of itself, as it travels along part of the Clark County Scenic Drive pass a gorgeous stretch of the river flowing over volcanic rock formations. Plus, you can stop at Lucia Falls along the way! You might think Naked Falls is still closed, but it is in fact up and running once again. This popular cliff diving spot in the Washougal River was temporarily closed due to safety concerns back in 2016, but opened once again in the summer of 2017. There are a number of (hilariously explained) rules to abide by, which includes not jumping out of trees, littering, or participating in any shenanigans or “tom foolery”. 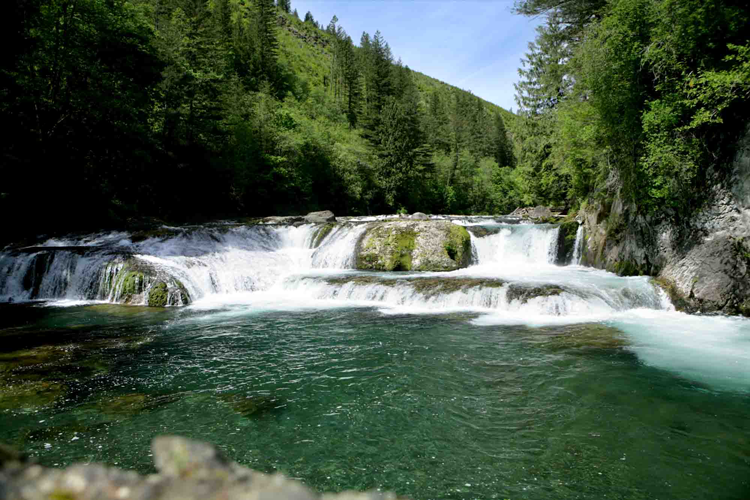 Visit this exciting swimming hole in Southwest Washington to see what all the hype is about. 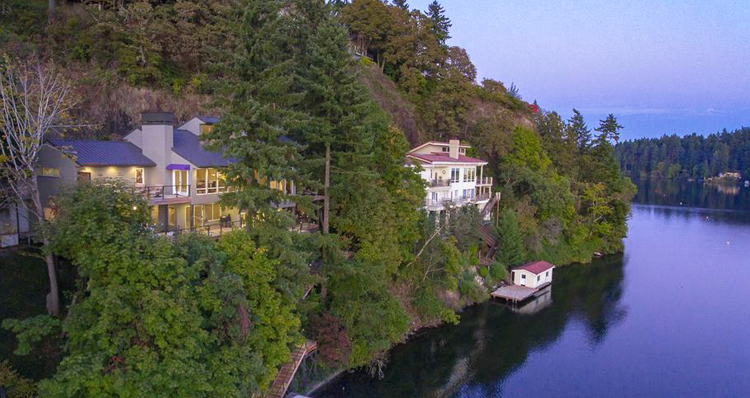 Plus, the scenery here is particularly breathtaking — whether or not you decide to jump in the water. What swimming holes do you frequent in the summer? Or would you rather keep them a secret? If not, let us know in the comments below!